Copy of Orvis vise with black jaws that are tapered to point. Good for flies down to 28's. Not a bad vise for the money. Great starter vise or childrens vise. It is time to start tying flies if you do not already. Great satisfaction in catching fish on your flies. Also, great winter hobby. Copy of Thompson Model A. Chrome with chrome jaws. C clamp for attaching to tying table.Great for starting out or childrens vise. We will tie any pattern yo like or your favorite pattern of your own design. Please allow us two weeks for completion. Minimum quantity is 1/2 dozen of a size. Cost varies with type of flies. Stand and dry flies, wet flies and nymphs $10.00 per 1/2 dozen and $18.00 per dozen. Others prices according to pattern. In the near future we will stock regular patterns and have them available for immediate delivery. Check the website for pattern listings. 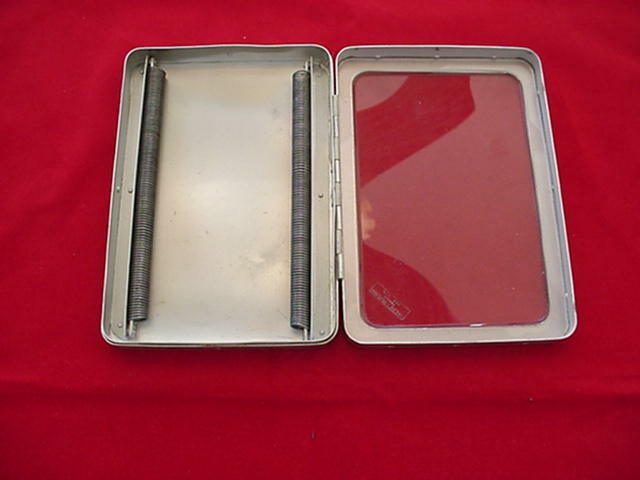 Rare metal box with see through top window. Two sets of springs for flies. 6 1/2 x 4 1/2 x 1. Great fry box for salmon and steelhead flies. Large springs will hold the largest flies by the bend of the hook. Excellent condition. Circa 1950 - 1960. This is a dozen of my favorite Spring Creek Flies in a plastic 12 compartment box. I set up two selections one for Eastern Creeks like the Letort and Falling Spring and another for Our Western Creeks like Henry's Fork and Armstrong and DePuys etc. A terrific Selection and all flies are guaranteed to catch fish. If you have favorite patterns, let me know and we can include them. This is a selection of one dozen of my favorite Western Trout Patterns. All flies are tied by myself or by local tiers and are guaranteed to be as good or better than any you have used. Also guaranteed to catch fish. They come in a plastic 12 compartment box suitable for using in your normal fishing. You can always pick the patterns that you would like yourself. Our standard flies are $18.00 a dozen. 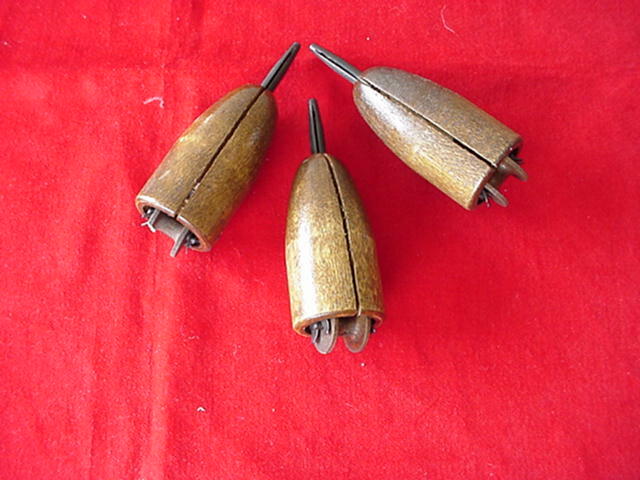 Handsome beautiful wood bobbins made in the style of the old herters bobbins that were made of metal. I use one presently along with these bobbins. I like the way they fit in my hand. Real Classics that can also be used today. They fit in your hand perfectly and are very easy to use. These are circa 1940's during WWII when metal was not available. A great addition to your fly fishing gear and definitely a conversation piece. This item is the full Rooster sdkin not just the cape. 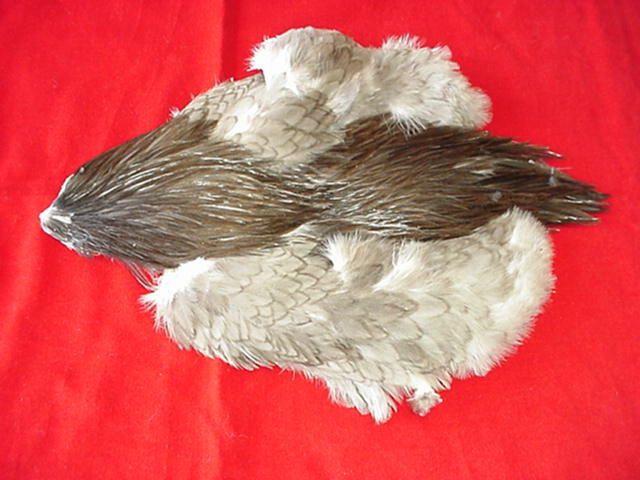 It is a Harry Darbee Blue Dunn Rooster skinned by Harry himself. Documentation included to prove authenticity. It probably shopuld be framed with some Catskill Dry Flies such as the Quill Gordon and Hendrickson patterns etc.